The first comprehensive renovation in the Wyoming Capitol's 129-year history is fixing critical safety issues, replacing outdated, failing systems and almost doubling the building’s public meeting spaces. “The time to do this project is now as the Capitol had real safety issues,” said House Speaker Steve Harshman, who serves on the Capitol Rehabilitation and Restoration Oversight Group (Oversight Group). The Capitol Square Project is comprised of four interrelated components: the rehabilitation and restoration of the Capitol; replacement, relocation, and expansion of the central utility plant; the remodel and expansion of the tunnel that connects the Capitol to the Herschler Building; and the rehabilitation and expansion of the Herschler Building. The Legislature saved more than $100 million before authorizing the project in 2014. The major project components, total approximately $219 million of the $299 million budget for the project. The other $80 million has been allocated to furnishings, equipment, design services, a contingency fund to address unanticipated needs for the project, and temporary space for offices relocated due to construction. The damaged external entablature, made of sheet metal, is being replaced and a structurally sound steel system will secure it to the building. The repaired stone appears lighter in color but will match the rest of the sandstone as it weathers with time. The new entablature is also shown in this picture above the stone. The removal of the dropped ceilings has uncovered hidden archways, coffered ceilings, historic paint, and decorative columns. The invasive infrastructure work necessary to repair the building allows for the restoration of many of these elements. To make the building safe for future generations, the Capitol is undergoing a much-needed comprehensive repair. The Capitol has very few smoke detectors and no smoke evacuation or fire suppression systems. Fire and smoke could spread quickly throughout the building, because there are no reliable smoke and fire partitions to separate one space from the other. In a fire, occupants would have less than five minutes to evacuate the building safely, and many parts of the building and the site are not compliant with standards set by the Americans with Disabilities Act (ADA). The entire electrical system in the Capitol is obsolete, considered hazardous. 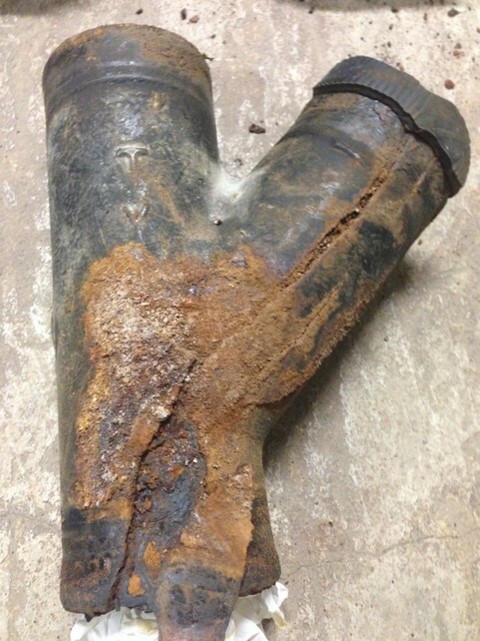 The building’s plumbing and steam systems are badly corroded with frequent leaks that cause substantial damage. The existing heating, ventilation, and air-conditioning (HVAC) system frequently fails. While the exterior sandstone is generally sound, some stones are damaged and loose, even to the point of falling off the building. To maintain the Capitol’s historic look and stay cost–effective, the project will only replace stone for life safety issues and water management. Peeling paint on the metal entablature has caused corrosion in some areas while in other places water has infiltrated the building through cracks. To fix this, the entire entablature, except for decorative elements, will be replaced. As part of the Capitol’s rehabilitation, all mechanical, electrical, and plumbing (MEP) systems will be reorganized in vertical chases from the garden level through the attic, removing the unnecessary piping and ductwork and allowing for more efficient systems. Two new elevators and interior staircases will help address egress issues. The existing elevators will be replaced with larger versions and relocated out of the monumental corridors. The internal staircases in the House and Senate Chambers will extend to the garden level, providing a second means of egress in an emergency. Restrooms will be located on every floor on both the east and west sides of the building. Prior to the renovation, the main public restrooms were on the garden level. The addition of new MEP systems, the replacement of elevators, and the increase in restrooms have consumed more space in the Capitol, requiring the relocation of staff and functions that were previously housed there. The Herschler Building, due to its proximity to the Capitol, is being renovated and expanded to accommodate these displaced office needs. The Capitol Extension also will be expanded to create meeting rooms and other public service spaces like eventually a Student Learning Center. Another principal driver of the project has been to provide the opportunity for increased public participation in the legislative process. Previously, only a handful of people could fit into the meeting rooms during legislative committee hearings. That will change with the renovation. "What I'm looking forward to is having a real people's house where the citizens of Wyoming can come here, participate in the legislative process, and see their five elected officials," said Senate President Eli Bebout, who is the co-chairman of the Oversight Group, along with Governor Matt Mead. When complete, the Capitol will have four public meeting rooms, including two new rooms on the first floor that each will seat 45 people, an existing third-floor meeting room that seats 45, and a restored Territorial Chamber that will seat 70. When these rooms are not in use by the legislature for committee meetings, they will be available to the statewide elected officials and for official state business. The renovation also will add six public meeting rooms in the Capitol Extension. Four of these rooms will seat 75 people, and two of them will seat 100. Space for a 250-seat auditorium has been set aside for the future. The restored room is envisioned in a watercolor design sketch by Paul Brown, a member of the project team. The stained glass laylight and the chandelier were in another room and will be returned to their original location in the historic chamber. 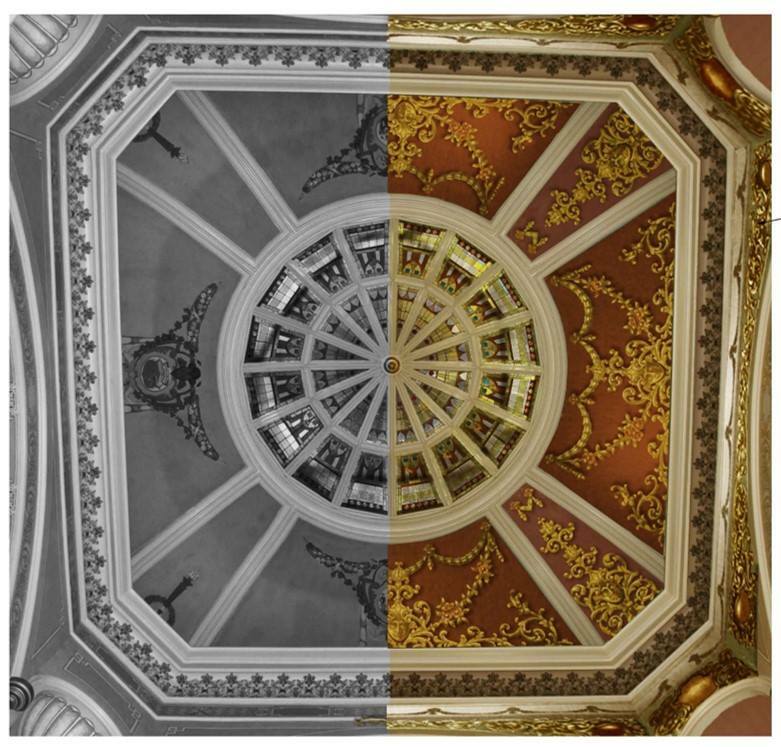 A comparison of what the ceiling of the Capitol Rotunda looks like today (black and white photo) and the preliminary design (far right, in color) which depicts the original 1888 design. A design sketch showing how the removal of the Herschler Building's atrium restores the views to the Capitol. 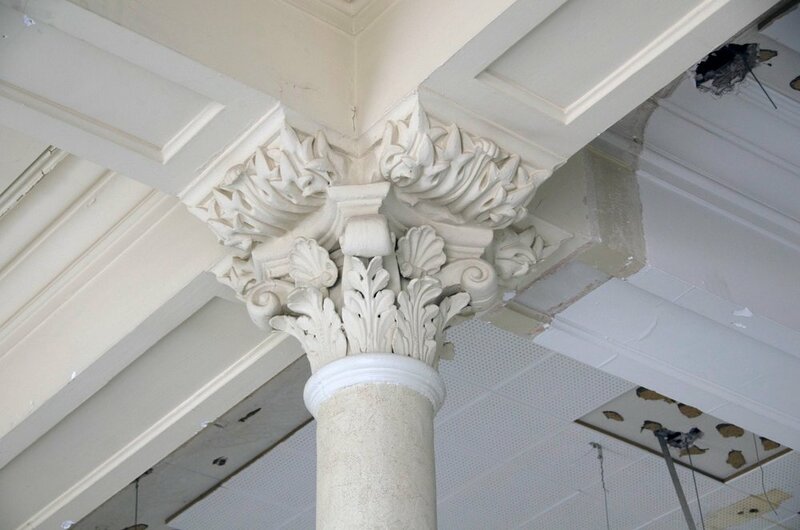 The invasive work to repair the Capitol has created a rare opportunity to restore historic elements that were significantly altered during previous renovation projects. “Visitors will see more of the original grandeur of this beautiful building than has been seen for over a hundred years,” said Tony Ross, a former President of the Wyoming Senate, who serves on the Oversight Group. Among the project’s most notable features is the restoration of the two-story grandeur of the historic Wyoming Territorial Assembly Chamber. This spectacular room, complete with an ornate stained-glass laylight in the ceiling, will become the Capitol’s largest public meeting room. The Wyoming Capitol earned its National Historic Landmark status, not for its architecture, but for its historic importance in the history of women’s suffrage. Throughout the building, dropped tile ceilings have been used to cover mechanical, electrical, and plumbing systems. With the new systems running through vertical chases, the dropped ceilings are no longer necessary, and the monumental ceiling heights will be restored, exposing previously hidden historic decorative elements, such as coffered ceilings, cornices, ornate columns, and arched doorways. Natural light will transform the building with the removal of the tile ceilings, because the windows throughout the Capitol were partially blocked by the lower ceilings. Skylights and laylights throughout the building are being restored, which will flood the building with natural light. Additionally, on the east wall of the House Chamber, three historic windows that were filled in during the 1970s will be restored. All of the interiors will be repainted with historic paint finishes, including the House and Senate Chambers. The decorative ceiling in the Rotunda will be returned to its 1888 design. As for the other parts of the building, as much of the historic fabric as possible will be retained. The woodwork and marble tiles are only being replaced or repaired where needed. Visitors will see these many restored historic features when the Capitol reopens in mid-2019. Although the Capitol and its grounds are closed to the public during the restoration, taking a sidewalk tour around the Capitol is a way to appreciate the detail in the architecture. You can visit the Capitol exhibit at the Wyoming State Museum to learn more about the building's significance to our nation’s history, as well the architectural and design elements. The museum, located at 2301 Central Avenue, just a short walk from the Capitol, is open 9 am to 4:30 pm, Monday through Saturday and admission is free. Learn more and sign up for project updates at www.wyomingcapitolsquare.com. Follow the construction progress and see behind-the-scenes photos on social media.